In late 2012 the New Mon State Party (NMSP) initiated a vigorous anti-drugs campaign throughout various Mon communities in Burma.1 Arrests of numerous drug smugglers were made, drug-using youth were sent to NMSP rehabilitation centres, and signs were erected in villages calling on residents to resist and combat drug use. This wave of action brought an issue to the table that had thus far been surrounded by silence from relevant authorities. Prior to this, domestic and international discussions of Burma’s drug problems had largely been restricted to regions in Upper Burma, in particular Shan State. However, NMSP action highlighted that drugs were also prevalent in Mon communities and were being abused by Mon youth. With a new focus on this issue, various questions have been raised. Exactly how widespread is the problem? Where are these drugs coming from? What are authorities outside of the NMSP doing to tackle drug use and trading? So far, these and other queries have been met with few adequate responses. The main purpose of this report is to take on some of these questions and begin the process of providing concerned parties with satisfactory answers. Using testimony from a range of sources, HURFOM aims to offer a preliminary account of drug use and trading in Mon communities. The report also serves as a call to action to various authorities, whose co-operation is needed if decisive action is to be taken. Now that the matter has been brought to the table by the NMSP, HURFOM aims to ensure that authorities do not fall back into a pattern of silence and inactivity. We entreat all authorities, in particular the Burmese government and ethnic armed groups, to follow the lead taken by the NMSP and take up the challenge of tackling drug use in their domains of authority. This report concerns drug use in the “Mon community” in Burma, referring to Mon individuals living in Mon and Karen States. It begins by explaining the background of drug use and trading in Mon communities before moving on to focus on the particularly acute drug problem reported among the young Mon population. Consideration is then given to individual testimonies, followed by a detailed exploration of various authorities’ responses. The report concludes by issuing a set of recommendations suggesting how the broad set of responsible parties can best move forward on the issue. It is of note that a report on the drug issue in the Mon community is a very new kind of undertaking for HURFOM. In the past, documentation has focused on direct human rights violations. However, a period of reform in Burma means that some very different human rights issues have come into focus. Discussions about the future economic and social development of the country have now begun in earnest. It is considered that a successfully developed country will have the capacity to ensure that all of the human rights of its citizens are satisfied, leaving no remaining excuses for any deficiencies. Drug use, particularly among youth, poses a threat to such development. For this reason, addressing the problem is a human rights issue and a matter of prime concern for HURFOM. HURFOM has documented the voices of Mon populations since 1995. Research for this report was carried out following methods used in previous investigations. Interviews were conducted by field reporters who shared this information with HURFOM colleagues via satellite phones, online communications, and handwritten interview transcripts. Research was undertaken from March to May 2013 by four field reporters working under the guidance of one field coordinator; unless otherwise indicated, all references here to HURFOM sources refer to research collected during this period. Field reporters conducted interviews in Yebyu, Ye, Thanbyuzayat, Mudon and Moulmein Townships (all located in Mon State). Information was also obtained from partners in Paung (Mon State), Kyiakmayaw (Mon State), and Kyainnsiekyi (Karen State) Townships, although HURFOM field reporters did not themselves visit these areas. In total, around 140 individuals were interviewed. These included drug users, families of drug users, students, monks, ordinary community members, NMSP officials, members of the Karen National Union (KNU) and Democratic Karen Buddhist Army (DKBA), three officials from the Myanmar Police Force and two doctors. Where possible HURFOM uses interviewees’ real names, though many requested to remain anonymous or to appear under an alias. In the process of conducting interviews, reporters faced numerous difficulties. In general, gaining the trust of interviewees was difficult for field reporters due to the sensitive nature of the issue. The majority of drug users were unwilling to supply detailed accounts of their own experiences, fearing that giving testimony might lead to repercussions. The NMSP, KNU and DKBA sources were in general hesitant to supply specific information. Of the three Myanmar Police Force officers interviewed, two were notably defensive and questioned the field reporter about why the testimonies were being collected. In Mudon Township, reporters said that they were physically prevented by Burmese military forces from accessing an area rumoured to be a hotspot of drugs trading. With the intimate workings of the drugs trade surrounded by secrecy, reliable information on its history and current operations was difficult to obtain. 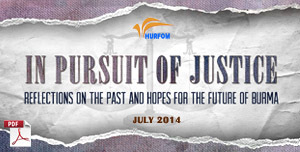 In addition to new materials collected, this report includes information, testimonies and images from HURFOM’s extensive archive. Some facts were also drawn from drugs research produced by the United Nations Office on Drugs and Crime (UNODC), World Health Organisation (WHO), US Department of Justice, and US Department of State. On the whole HURFOM noted a glaring absence of research targeting drugs production, trade and use in Mon and Karen States. Whilst the Burmese government and international organisations have produced data regarding the country as a whole, this is almost universally restricted to Upper Burma and largely concerns the Opium trade. Despite an on-going campaign against drug use in areas of Mon State, NMSP officials were either unwilling or without the resources to supply data on drug consumption in their areas of administration. Given these difficulties, HURFOM emphasises that the research presented here is in many ways incomplete. 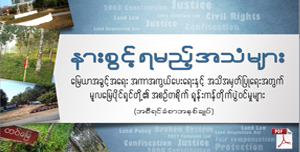 HURFOM calls on local residents, CBOs, NGOs, grassroots organisations, armed groups, the Burmese government and international organisations to sustain this focus and undertake research that goes beyond this report’s limits. In particular, HURFOM calls on all parties to ensure that drugs research can be undertaken with full cooperation and in the spirit of free investigation. The history of drug use in Mon communities in Burma is difficult to trace. Reports suggest that drugs first became prominent in Mon areas after the Burmese military took control of the country in 1962.2 It is claimed that, with support from corrupt army generals and no prevailing rule of law, Burma’s drugs trade was given space to flourish. As a result, some of the drugs involved in this trade started to reach Mon populations. According to a 45-year-old Public Health graduate who requested to remain anonymous, more widespread drug use in the Mon community developed under the rule of General Than Shwe from 1992 to 2011. This source pointed to increased labour migration caused by a languishing national economy as a key factor driving the growing drugs presence in Mon communities, with heavy drug use the result of exposure to and influences from foreign countries. This reporter is just one of many voices that have recently articulated fears about a severe and sharply rising drug problem in the Mon community today.7 Numerous individuals have reported that drug use in Mon areas of Burma has become casual, open, and commonplace. Whilst adults are also reported to be using drugs, the primary concern expressed by interviewees referred to the rate of drug consumption amongst Mon youth between the ages of 15 to 25. Evidence shows that young Mon people are beginning to use drugs at 15 or 16 years of age, with addictions developing and accompanying these individuals into adulthood.8 A group of monks from Mawkanin village in Ye Township suggested that trying drugs has become something of a rite of passage for young Mon people. Reports from the community have listed even higher figures. Several interviewees,14 including a village administrator from Ye Township and a youth from Thanbyuzayat Township, claimed that they suspected 80% of young Mon people today to be using some kind of drug. Whilst this astronomical figure merits more detailed research, it is nonetheless significant that both Mon youth themselves and village leadership are ready to attest to a staggeringly high rate of drug use observed amongst young Mon people. Research conducted by HURFOM into drug use among these populations indicated use of a range of drugs, including Marijuana, Opium, Heroin, Crystal Methamphetamine and tranquillisers.15 However, far more commonly, interviewees emphasised Ya Ba, tablets containing a combination of Methamphetamine and caffeine used for a strong stimulant effect, and Kratom Leaf, a leaf consumed for a milder stimulant effect. Interviews suggested that these two drugs are considered to be at the heart of Mon people’s rising drug problem. HURFOM has compiled profiles for both drugs, to be found here as appendices. Research suggests that drugs are available in townships across Mon and Karen States, including in some NMSP-controlled territories.17 According to reports, an individual in any given Mon community today intending to buy drugs does not have to look very far afield. It is likely that even where the purchase cannot be made within their home villages, a minimal amount of travel is required to find a seller. Certainly this was the case in each of the regions surveyed by HURFOM. This abundant availability suggests that behind Mon State’s villages and townships lies an extensive network of drugs supply. Unsurprisingly, the exact nature of this network remains shrouded in secrecy. Interviews revealed that for most people their immediate point of contact with the drugs trade was through dealers in their local area. Some sources suggested that members of ethnic armed groups in Mon regions are directly selling drugs to local people. areas, it is reported that drugs are being sold by young people from the surrounding community. One student at Technology University, Moulmein, in Mon State stated, “Young people, just the same age as us, come and sell drugs…not everyone can buy from them, only people who know the dealers”.19 Accounts suggest that, at least in certain areas, a good relationship with drug dealers is vital for buyers. However, the Mon drugs trade extends beyond local dealers. Perhaps the most pressing question is the source of drugs that are being sold at a local level. Some interviewees suggested origins in Thailand and Malaysia.22 Nonetheless, it is likely that at least a significant proportion are smuggled from other areas in Burma. Or indeed that many of the drugs entering Mon areas from neighbouring Thailand and Malaysia were first produced in Burma. From areas of production, drugs are smuggled to destinations across Mon and Karen States to fuel the local-level drugs trade. Often movement is facilitated by locally employed “carriers”, individuals who are paid or coerced to become pawns in the larger drug smuggling industry.26 Whilst no material evidence was uncovered, various sources suggested the network of drug supply to be headed by members of ethnic armed groups. ethnic armed groups (referred to here as “ceasefire groups”) are implicated in drug production as well as smuggling. As of now, these accusations have not been substantiated by concrete evidence. Indeed, fearful intervie-wees were often unwilling to supply more detailed information. However, with members of ethnic armed groups implicated as complicit throughout the drugs trade, from dealing and smuggling to production itself, it seems clear that at the very least further investigation into the matter must be pursued. With many youth drug users unwilling to talk to HURFOM about their experiences, a great deal remains to be uncovered about the seemingly widespread culture of youth drug use. However, a key theme arose from interviews, namely that the issue of drug use amongst Mon youth is as broad as the term “youth” itself. It is in a sense misleading to talk about “Mon youth” as a homogenous group: in reality, it comprises of a set of young individuals with very divergent backgrounds, realities, and aspirations. Whilst some universal root causes, practices and consequences of drug use can be identified across Mon youth as a whole, interviews made it clear that drugs have manifested themselves in different young people’s lives in some very different ways; a fact often masked by generalisations made about youth as a whole. Aside from purely recreational use, drug use amongst university students is reported to be part of attempts by students to catch up on work in the frantic lead-up to exams. A 62-year-old expert, originally from Moulmein and with experience in Public Health and Drug Demand Reduction programmes, shared his view on drug use amongst young communities in Mon State. Referring to the class of more advantaged youth, as exemplified by university students, he in part put drug use down to stress. The same expert pointed to abuse of the tranquiliser Diazepam amongst the young upper classes and especially individuals in the music and entertainment industries. However, when we turn away from the group of university students and young high-rising professionals, some very different cases arise. 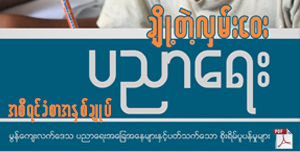 In Mon State it is estimated that only 10% of young people start university, with many others dropping out of education before completing High School, often due to financial difficulties within their families.36 For the remaining 90% who do not go on to university, a life of opportunity is often far from the norm. Instead, manual labour in factories or plantations may be among the few options that young people have to support themselves. Often Mon youth migrate to work in neighbouring countries such as Malaysia and Thailand, where hours can be long and workplace conditions dire. Various interviews revealed a narrative that played out again and again.37 Typically, a young person starts taking drugs (usually Ya Ba) as fortification against hard labour, looking to feel stronger and avoid exhaustion. However, over time he/she needs to take the drugs in greater and greater quantities to experience the same effects. In this way, a deep addiction develops. Having started experimenting with drugs to better earn an income, the young person begins to forfeit their salary to fuel a growing drug dependency, leaving little or no money to support his/her family. A downward spiral ensues. Physical and mental states deteriorate, often resulting in joblessness and rendering the young person virtually unemployable. Where rehabilitation does not take place, estrangement from family, serious injury, or even death are known ways in which the story ends. As compared to accounts of drug use in university populations, those stemming from the young labour force notably contain higher levels of trauma, perhaps indicating more routine use and greater risk among this less advantaged group. Reports also suggest a final sector of youth drug users who experience a lack of opportunities in a different way.38 Rather than coming to drug use to cope with the demands of physical labour, drugs are perceived as a way to relieve the boredom and inertia of a life with few future possibilities. Youth in this group may have dropped out of education and many are unemployed. With little else to do and with few realistic aspirations to work towards, recreational drug use becomes an entertainment and form of escapism. Discussion now turns to question of why drug use is becoming a problem across the broad sweep on Mon youth, from affluent university students to unemployed youth. As indicated above, we can point to specific causal factors, such as inadequate opportunities, that apply to particular groups of drug users. However, some more universal underlying causes can also be found. Youth interviewed explained how they had learned new methods of drug use from their friends. I?” However, due to the addictive nature of the substances taken, casual experimentation can lead to heavy addiction, as described by a young person living in Three Pagodas Pass. This trend is exacerbated by the ready availability of drugs (resulting from a burgeoning drugs trade) and a general lack of repercussions for drug use and trading amongst Mon youth. Whilst the response of relevant authorities will be discussed in more detail in Section VI, on the whole it can be said that anti-drug crackdowns in Mon communities have been lacking, particularly on the part of the Burmese authorities. It is reported that university authorities will punish drug users if they are caught, but students are able to avoid punishment by concealing their drug stashes.42 In general it seems that, whether using drugs as a study aid, to help heavy labour, or simply as a new form of entertainment, young Mon people are largely left free by authorities to experiment with illegal substances as they desire. In addition to these root causes, a Public Health and Drug Demand Reduction expert consulted by HURFOM indicated that some young people may be more likely than others to develop drug habits due to their genes or upbringing. “Drug addiction is related to genetic factors. Everyone has their own personality. We have to understand what personality each person has. Because of their personality, some people want to oppose every prohibition. Therefore, most [youths] start using drugs because they want to oppose the prohibitions of their elder family members or relatives. This account offers an interesting suggestion. It seems likely that drug-using friends, an extensive drugs trade, lax enforcement of drugs laws and poor drug education have together pushed many Mon youth toward drug abuse. However, if this expert is correct, our account is incomplete without the inclusion of individual psychology and broken relationships in the family and wider community. Taken collectively, this indicates a staggeringly wide domain of accountability for the rising drug problem amongst Mon youth. Accordingly, the call for collective and co-operative action spans local authorities, national government, individual communities, and family units. Just like the root causes of drug use, its consequences have common themes, albeit varying with the circumstances of individual users. Alongside side-effects specific to particular drugs (outlined in this report’s appendices), drug use in general is known to have a range of physical and psychological repercussions for users. A key concern expressed by interviewees regarding the consequences of drug use in Mon youth related to the hope and perception that this generation are the future of the Mon people. With this in mind, communities are deeply worried that young people are putting themselves at high risk of serious medical conditions and even death. Equally, it was stated to be of concern that the future is in the hands of a “dizzy and dull” generation. Some interviewees expressed unease about the capacity of drug-affected young people to participate in national level politics as effective advocates for the Mon people. Various sources similarly expressed concerns about youth drug use endangering the progress of Mon people.52 Youth are considered by many to carry the responsibility of protecting Mon people and culture over the coming decades. If young people are seen, quite literally, as the future of the Mon people, then the ideal of a bright future necessitates a generation of bright, ambitious, hardworking and self-supporting individuals. A similar effect was noted among employed youth. Job performance was observed to suffer as a result of drug use, with many youth eventually fired by employers or quitting their jobs.56 Even where drug users kept their positions, they were often noted to spend all of their income on drugs. Thus, rather than moving towards becoming self-supporting, many youth are perceived to be growing increasingly dependent on their families to survive. In addition, contrary to being champions of the Mon community, many Mon youth are reportedly threatening their homes and villages. Local testimonies in the following section attest to drug use leading to theft, violence, damage of property, road accidents, and the breakdown of families. Whilst these issues apply to all drug users, it is of particular concern that the very people who are perceived as the future of these communities may in fact be complicit in their breakdown. It is worth noting that all of the above concerns apply to the future of Burma as a whole, as well as the future of the Mon people. With reports alleging that drug use among young Mon people is ever on the rise, the concerns outlined here illustrate vital reasons why both Mon and union government authorities must take immediate action on this issue. In the process of collecting information on drug use in Mon populations, reporters were privy to powerful accounts of the harsh realities of drug abuse and addiction. Aside from broader concerns about the future of the Mon people, one of the most compelling arguments for combatting drug use is the profoundly distressing impact that it can have on individual lives and communities. The testimonies presented here represent only a small selection of these stories. With many individuals unwilling to talk to reporters about their own experiences, it can be assumed that many more tragic stories remain untold. “My name is Ah Tun and I was a driver before I moved here. Now I am a mechanic and a plantation worker. When I was a driver in Halockhani village [Three Pagoda Pass Sub-Township], I used to smoke, drink and consume drugs with friends in order to get the strength and courage to drive. I was addicted to drugs after using them for a long time. I spent all the money I earned on drugs and gambling and did not go back home. I did not want to work, all I wanted was drugs. My boss fired me because I missed work so many times. I was depressed because I had no money. I went back home and harassed my wife to get money from her. In my depression I threatened my wife with a knife to get money, but she only had 250 Baht. Giving them this small amount of money, I intimidated my brother and his friend into buying drugs for me in Jone Kwee in Three Pagodas Pass Township. They got me 4 tablets and I took them all with no regard for my own life. In families dealing with drug addicted relatives, domestic violence, financial ruin and divorce were common themes collected during interviews. “Before, he just drank beer. But last year the KNU closed the forest and he needed to steal wood from the Thai forest [to keep up his job in woodworking]. Due to security, he could not work in the daytime. He needed to cut the wood at night. His reason for using drugs was that he needed them to get energy for his job. At first he just took half a tablet per day, but later he used a whole tablet and now he cannot stop using. Now he takes 4 tablets per day. It costs 120 Baht per tablet. We cannot survive on his income because he just spends it on drugs. Due to heavy drug use, now he feels tired all of the time and cannot work very hard. “After [my son] dropped out from school he said that he needed a motorbike to become a taxi driver and we bought it for him. After he got a motorbike he did not stay at home. He came back home very late. We did not know that he was using drugs. Then he lost weight and became skinny. He did not eat or sleep much. Also, he did not pay his income to me. When we asked him for the money he gave the excuse that he had needed to fix his motorbike and his friend had lent him money, so now he had no money. We had no experience of drug use and trusted what he was saying. Another important voice on the issue is that of ordinary residents in Mon communities who have begun to witness the impact of drug use in their towns and villages. “Some news that I heard recently was that it [drug use] has caused accidents, which led to the death of victims. Men are lazy and unintelligible after using drugs, and so mostly are not able to work. As a result of this their wives, children and parents, who depend on their income, are confronted with a daily income problem. Resettlement is given the responsibility of helping rehabilitated drug users to go on to live normal lives, with resettlement and teaching means of livelihood to be conducted as necessary. Users who fail to register with the government or who do not co-operate with medical treatment are liable to three to five years of imprisonment. In addition, a number of punishments are listed for individuals involved in the production and sale of drugs, or who mislead government drug investigations. Cultivation of prohibited plants, involvement with materials used in drug production, inciting drug abuse, and the possession, transport or transfer of drugs (not linked to sale) all merit a sentence of 5-10 years. Where possession, transport or transfer can be linked to sale (as in cases where the suspect has more than a specified quantity of the substance), or where a person has communicated intent to sell, individuals face from 10 years imprisonment to a life sentence. Where a person is directly implicated in the production, distribution and sale of an illegal drug, or where they can be linked to exports and imports, sentences range from 15 years to life imprisonment or even a death sentence. These hefty punishments are matched by the strong rhetoric that enshrines the law, naming the prevention of the dangers of drug a national responsibility and linking drug use to “the degeneration of mankind”. In general, the Burmese government’s anti-drugs programme has failed to meet the promises made in government policy; if the government is aspiring to eradicate drugs from the country by 2019, it has a very long way to go. Indeed, deficient government anti-drug efforts thus far can be pointed to as facilitating the rise of Burma’s drugs trade and encouraging individuals to experiment with drugs without fear of legal consequences. On the whole, anti-drug legislation remains unenforced and the CCDAC has not fulfilled the responsibilities assigned to it in a meaningful way. Reports suggest that government anti-drug activity is particularly lacklustre in Mon communities. Of 23,899,156 Methamphetamine pills seized by the Burmese government in 2009, only 104 were in Mon State.74 In part, this may be due to international pressure being focused on the high drug-producing areas of Upper Burma that supply the international drugs trade.75 Whatever the reasons, the drugs problem in Mon and Karen States remains widely unacknowledged and unaddressed by the government. According to one former Ya Ba user in Mon State, “Even though the government has made selling drugs illegal, they just put up signs around the town and do nothing else to enforce the law.”76 Nai Zayar Min, a 40-year-old former school teacher from Ka Law village in Southern Ye Township corroborated this observation, saying that the only anti-drug activities he had seen in his area had come from the NMSP and not the government. The 2012 International Narcotics Control Strategy Report of the United States Department of State Bureau for International Narcotics and Law Enforcement Affairs put CCDAC’s failures down to a combination of lacking resources, fragile domestic politics and possible government corruption. However, regardless of such pledges from the NLD, it remains the case that effective action on the drug issue will require significant commitments from the Burmese government itself, in particular ones that go beyond the creation of slow-moving working bodies and the signing of unenforced international declarations. In particular the CCDAC, a promising institutional structure in theory, must be transformed into a body that is effective in practice. The remainder of this report will focus on the response from other bodies, from local authorities to ethnic armed groups. Yet it is important to emphasise that, if increasing drug use in Mon communities is to be tackled, the government has an important responsibility, with the support of other groups, to lead the way in the fight against drugs. Whilst under the remit of the Burmese government’s response, it is interesting to focus specifically on the response of local authorities to the drugs issue. A lack of commands from State level authorities to crack down on drug use in Mon communities has been compounded by a lack of interest from local authorities in arresting offenders. Many people interviewed suggested that this was a result of corruption in the ranks. Corrupt officials are reported to be taking bribes from drug smugglers and dealers to allow these individuals to continue their activities without impediment. U Lwin, a goldsmith from Paung, told HURFOM that corrupt local officials in his township have allowed the area’s drugs trade to flourish. Thus far, the most promising anti-drugs activity witnessed in Mon communities has been undertaken by the NMSP. In the past, NMSP has taken some intermittent actions against drug use in its controlled territories. For example there are reports of arrests of drug consumers by the NMSP in the Halockhani resettlement camp in the 1990s.90 However, in more recent times anti-drug activity has become one of NMSP’s flagship campaigns, which it has extended to Mon areas beyond NMSP-controlled territory. Arrests have included some well-publicised cases. On December 18 2012 Mehm Ah Pout, a 23-year-old from Waekharou Village, was arrested near the military cemetery in Thanbyuzayat Township with 17 Ya Ba tablets in his possession.94 An NMSP anti-drugs official had contacted him pretending to be a drugs buyer, and as a result was able to catch him in these incriminating circumstances. His testimony led to the arrest the following day of 28-year-old Mehm Ah Beat, also from Waekharou village, who was found with 276 Ya Ba tablets. NMSP has alleged that the two were part of the same drugs trading circle. Once these individuals had been processed through the NMSP system they were handed over to the local legal system to be tried in court in Moulmein, the capital of Mon State. According to an NMSP member who requested to remain anonymous, plans for the anti-drugs campaign emerged during peace talks between NMSP and the Burmese government in early 2012. It is claimed that in these talks the NMSP pledged to take responsibility for the drug problem amongst Mon people. He explained that after this point new resources were directed towards anti-drug activities. Indeed, the NMSP drugs campaign seems to have made a strong impression on others in Southern Ye, giving the group a foothold in an area where previously their influence had been lost. This testimony supports HURFOM’s observation that, whilst on the one hand many in the Mon community have been pleased by a new anti-drugs push that goes beyond anything Burmese authorities have offered, others have become frustrated that, given the scale of the problem, the campaign has not gone far enough. These villagers expressed some important concerns, notably raising the possibility that some NMSP members may be failing to carry out the party’s campaign due to individual corruption. Investigations into bribery and corruption should be undertaken, but it can also be pointed out that in terms of anti-drug activity there are limits to what the NMSP can be expected to achieve alone. This is particularly true in Mon communities where the NMSP is not the primary or even a major source of authority. Whilst NMSP anti-drug activity thus far has largely been commendable, a full solution to the drugs issue must require the support and co-operation of all other groups considered here, in particular the Burmese government. In general, the many other Mon and Karen armed groups acting in and around Mon communities in Mon and Karen States have not made discernible moves to tackle drug use or trading. HURFOM talked to one KNU officer about drug use and trading in his area of concern.104 He remarked that he had personally observed many negative effects of drug use and that in the past two months a large amount of drug-related reports had been submitted to his liaison office. However, he said that whilst the KNU has a drug reduction policy, it was not taking action because it did not want to make enemies. With their recent 2012 ceasefire still fragile, he expressed that if they were to act on drugs they would need the support of the Burmese government. where they are not suspected of being direct participants in this trade, like all other bodies discussed here they are widely reported to be failing to act as a result of bribery from drugs smugglers and dealers. Whilst these varying degrees of complicity explain the lack of anti-drug activity by individual members, this suspected involvement with the drugs trade makes the co-operation of armed group leadership of prime importance. There is a strong onus on group leadership to investigate any suspected wrongdoing amongst members and preserve the integrity of their groups by bringing effective anti-drug policies to fruition. As outlined in the introduction, this report is only the very beginnings of a detailed investigation into drug use in Mon communities. It is hoped that other parties will pick up where this report has left off, undertaking comprehensive research into the exact scale and nature of the issue. 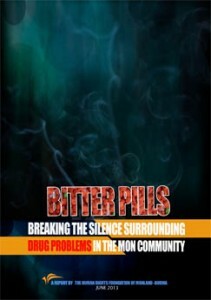 Nonetheless, from our inquiries HURFOM has found drug use to be an issue of acute concern to many in the Mon community. With reports suggesting drug use to be widespread, especially amongst youth, HURFOM echoes calls from the community for the drugs issue to be brought to the fore by all relevant parties for the sake of afflicted individuals, the future of the Mon community, and that of Burma as a whole. Thus far, with the exception of recent NMSP anti-drug activities, the response of the Burmese government, local authorities and ethnic armed groups has been disappointing; indeed it is likely that the collective lack of action has encouraged, rather than inhibited, the growth of drugs consumption and trade in Mon communities. The failure to act effectively against drugs is particularly unsatisfactory on the part of the Burmese government. Therefore, HURFOM concludes that the Burmese government must lead the way in taking action against drug use and trading in Mon communities, with the close co-operation of all ethnic armed groups exerting influence in these regions. In addition to promoting decisive action on the drug use, HURFOM calls on all parties to end the culture of corruption that has allowed pleas from the community for assistance to fall on deaf ears. For the Burmese government to publicly acknowledge the drug problem in Mon and Karen States and initiate detailed research into the matter. For the Burmese government to honour both its duty to protect its citizens and pledges made to the international community in the May 2013 Nay Pyi Taw Declaration; as a result, to take decisive action against the country’s drug industry. In particular, to transform the CCDAC into an effective working body (through greater government support and funding), with activities that combat use of drugs of all types and extend to all areas of the country, including Mon and Karen States. It is recommended that CCDAC proceeds by strictly enforcing anti-drug legislation in affected areas, with fair investigation and punishment of suspected offenders. However, also to work with the community to introduce a state-sponsored programme of (i) Education about the risks of drug use, (ii) Rehabilitation of existing drug addicts. For the Burmese government to act to reduce unemployment and other conditions that encourage rising drug use in Mon communities, in particular creating new job opportunities. For the Burmese government, local government and ethnic armed groups to undertake strong action to reduce the corruption that supports the drugs trade and prevents successful anti-drug campaigns. In particular, for all parties to promote transparency of action, with leadership investigating and punishing individual members found to be complicit in the drugs trade. For all ethnic armed groups working in and around Mon communities to, following NMSP’s strong example, enforce extensive anti-drug campaigns. In addition, for these armed groups to co-operate with both each other and the Burmese government to produce maximal effective action. For the Burmese government, local authorities and ethnic armed groups to provide relevant data upon request and to allow CBOs, NGOs and grassroots organisations to carry out data collection on drug use freely and without impediment. For the community to assist the authorities in anti-drug campaigns and to share information that will assist the elimination of drug use. In the case of employers, to enforce strict anti-drug policies in the workplace. For civil society, religious and grassroots leaders to raise and explore the issue of drug use in their own communities, encouraging individuals to resist drug use. For donor agencies to make funds available to NGOs, CBOs and grassroots organisations specifically for the implementation of research, capacity building, rehabilitation, and education and health programmes in drug-affected areas in Mon communities. For the international community (most notably ASEAN, UNODC and the Thai government) to acknowledge and take an interest in the drugs problem in Mon and Karen States. For the Thai government in particular, the large number of Mon migrants living inside their borders makes a solution to this issue crucial to their own interests. As a result, for the international community to (i) Support and (where appropriate) initiate anti-drugs activities in this region, in particular for the UNODC to instigate a thorough research programme, (ii), Call on the Burmese government to take effective action. What is Ya Ba? Ya Ba comes in the form of small, often pink, tablets containing a mixture of Methamphetamine and caffeine. It comes in different types, WY and R (these letters are printed onto the tablets), with WY reported to be of slightly better quality. What does Ya Ba cost? Ya Ba can cost anywhere from 2,500 to 7,000 Kyat per tablet, depending on where and when it is purchased. Whilst on average Ya Ba can be found for around 5,000 Kyat, students have reported that heightened demand during the school year inflates prices beyond this. History of Ya Ba: Methamphetamine was introduced to Southeast Asia during the Second World War, when it was used by soldiers having difficulties staying alert for long periods of time. Today, Ya Ba is the most common form of Methamphetamine found in Southeast Asia. At first the use of Ya Ba was mainly restricted to workers looking to enhance their performance (for example, truck drivers and plantation workers), but by the late 1990s it was also being used recreationally by youth. Whilst Thailand is known as the region’s hotspot for Ya Ba use, most of these tablets are reported to have been produced in Burma. 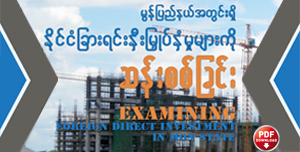 Ya Ba use within Burma itself is widespread and steadily on the rise, including in Mon State. Many in the Mon community attribute this trend to migrant workers developing a Ya Ba addiction whilst in Thailand and bringing this habit back with them to their homes in Burma. Where does it come from? Burma has been pointed to as the largest producer of Methamphetamine in East and Southeast Asia. In general, the Ya Ba used in Burma is produced within the country itself. Armed groups, in particular the United Wa State Army in Shan State, have been implicated in this production. In Mon communities Ya Ba prices are reported to be at their lowest in areas close to Taung Dee village, Kyainnsiekyi Township, Karen State; this fact points to Taung Dee as a possible host of Ya Ba producing operations. Dangers of Ya Ba: Ya Ba is a highly addictive substance. Amongst many physical defects, prolonged usage can result in fatal kidney and lung disorders, brain damage, strokes, convulsions, heart failure and liver damage. Ya Ba can also seriously affect the mental state of users, causing anxiety and violent behaviour, and even paranoid delusions and psychosis. Regular Ya Ba users can develop a tolerance to the drug and tend to require increasing quantities in order to receive the same satisfaction. This puts them at heightened risk of serious physical and mental harm through excessive doses. In some cases, users start to inject the drug directly into their drug stream, introducing the risk of contracting HIV or other diseases associated with intravenous drug use. What is Kratom Leaf? Kratom Leaf is the leaf of the Mitragyna Speciosa plant, a deciduous tree native to Southeast Asia. What does Kratom Leaf cost? In Mudon and Thanbyuzayat Town-ships, where Kratom Leaf is grown, one leaf sells for 50 Kyat. However, the leaf is transported to other townships and sold on at a premium. For example, in Ye Township a leaf can be sold for 200 Kyat. How is it used? Traditionally, Kratom Leaf was used by chewing the leaf. However, in recent times it has become common to make it into a “tea”, grinding the leaf and boiling it with water. Often liquids such as coffee, energy drinks and cough medicine are added to the mixture to enhance its effects. Effects of Kratom Leaf: In low doses Kratom Leaf acts as a stimulant, but taken in high doses it can become a depressant. Producing a milder high than Ya Ba, Kratom Leaf is commonly described as creating a feeling of increased freshness and energy. History of Kratom Leaf: Kratom Leaf has been used for centuries in Southeast Asia for medicinal purposes; it can be used as an antidiarrheal, to treat opium addiction, as an anti-depressant and to lower blood pressure. Recreational abuse of Kratom Leaf is said to originate in Thailand, where it was made illegal in the 1943 Kratom Act and grouped with Cannabis in the 1979 Thai Narcotics Act. It is reported that today’s heavy use of Kratom Leaf amongst Mon people is the result of migrant workers (particularly those working in Southern Thailand) bringing the practice and the plant itself back with them to their homes in Mon State. Where does it come from? In particular, Kratom Leaf has been reported as being grown in Mudon and Thanbyuzayat Townships. It is often grown in the land between rubber plantations, where it is planted alongside other crops to obtain some camouflage. Dangers of Kratom Leaf: The risks of using Kratom Leaf are not as widely documented as those of Ya Ba. However, it has been reported to be addictive, and that users suffer from withdrawal symptoms upon attempts to stop taking the drug (e.g. body aches, aggression and mood swings). Prolonged and heavy usage can lead to skin-darkening, nausea, constipation, loss of appetite and insomnia. Some cases of psychosis and hallucinations as a result of Kratom Leaf use have also been noted. 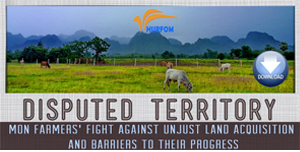 1 Human Rights Foundation of Monland-Burma I June 2013 HURFOM Field Reports, Nos. 2 & 3. 3 a.nd-Burma I June 2013 3 HURFOM Field Report, No. 2. 4 HURFOM Interview, No. 35. 5 HURFOM Field Report, No. 2. 6 HURFOM, ‘Don’t let your mind be destroyed’, 10 May 2013. 7 HURFOM Interviews, Nos. 2, 3, 4, 7, 8, 11, 26, 29, 31, 34, 35; HURFOM, ‘Mon State communities troubled by growing Ya Ba usage among teens and students’, 20 August 2012; HURFOM, ‘Young People and Drugs’, 8 May 2013. 8 HURFOM, ‘Mon State communities troubled by growing Ya Ba usage among teens and students’, 20 August 2012. 9 UNODC, Making the world safer from crime, drugs and terrorism, 2007. 10 UNODC, „Methamphetamine use on the rise in East and Southeast Asia‟, 12 December 2012. 11 HURFOM Archives, Ye Township, 2012. 12 HURFOM, „Young People and Drugs‟, 8 May 2013. 13 UNODC, World Drug Report 2012, 2012, p.iii. 15 Marijuana mentioned in HURFOM Interview, No. 1, Moulmein Township; HURFOM Field Report, No. 2; HURFOM Archives, Mudon Township, 2012; HURFOM, ‘Young People and Drugs’, 8 May 2013. Heroin: HURFOM, ‘Young People and Drugs’. Crystal Methamphetamine (under nickname “ice”): HURFOM Interview, No.38, Ye Township. Tranquilizers: HURFOM Interview, No.36. 16 Quoted in HURFOM, ‘Don’t let your mind be destroyed’, 10 May 2013. 17 HURFOM Field Report, No. 2. 18 HURFOM Interview, No. 23, Kawkareik Township. 19 HURFOM Interview, No.1, Moulmein Township. 20 HURFOM Interview, No. 14, Ye Township. 21 HURFOM Interview, No. 15, Ye Township. 22 HURFOM Interviews, Nos. 15, 27, 35; HURFOM Field Reports, Nos. 1 & 2. 24 UNODC, Amphetamines and Ecstasy: 2011 Global ATS Assessment, 2011, p.18. 25 HURFOM Interview, No. 22, Kawkareik Township; HURFOM Field Report No 2. 26 HURFOM Interview, No. 25. 27 HURFOM Interview, No. 3, Mudon Township. 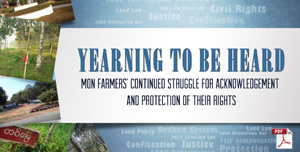 28 Human Rights Foundation of Monland-Burma I June 2013 HURFOM Interview, No. 22, Kawkareik Township. 29 HURFOM Field Report, No. 1. 30 Human Rights Foundation of Monland-Burma I June 2013 HURFOM Archives, Pa-an Township, 2012. 31 HURFOM Interview, No. 2, Moulmein Township. 34 HURFOM Interview, No. 4, Myawaddy Township. 39 HURFOM Archives, Pa-an Township, 2012. 40 HURFOM Interview, No. 5, Mudon Township. 41 HURFOM Interview, No. 20, Three Pagodas Pass. 42 HURFOM Interview, No. 28. 43HURFOM Interview, No. 1, Moulmein Township. 44 HURFOM Interview, No. 36. 45 HURFOM Interview, No. 20, Three Pagodas Pass. 46 HURFOM Interview, No. 36. 47 HURFOM Field Report, No. 2. 48 HURFOM Interviews Nos. 11, 34; HURFOM Archives, Pa-an Township, 2012; HURFOM, ‘Tracking the dangerous drug trade’, 11 January 2013. 49 HURFOM Archives, Pa-an Township, 2012. 50 HURFOM, ‘Don’t let your mind be destroyed’, 10 May 2013. 51 HURFOM Interview, No. 29. 52 HURFOM Interviews, Nos. 29, 31; HURFOM Archives, Mudon Township, 2012; HURFOM, ‘Don’t let your mind be destroyed’, 10 May 2013. 53 HURFOM Interviews, Nos. 2, 7; HURFOM Field Report, No.1; HURFOM Archives, Pa- an, 2012. 54 HURFOM Archives, Pa-an, 2012. 55 HURFOM Interview, No. 7, Mudon Township. 57 HURFOM Interview, No. 21, Three Pagodas Pass. 58 HURFOM Interview, No. 4, Mudon Township. 59 HURFOM Interview, No. 18, Three Pagodas Pass. 60 HURFOM Interview, No. 19, Three Pagodas Pass. 61 HURFOM Interview, No. 11, Ye Township. 62 HURFOM Interview, No. 34, Kyainnsiekyi Township. 63 All following detail of the 1993 law comes from SLORC, ‘Narcotic Drugs and Psychotropic Substances Law’, 1993. 64 Human Rights Foundation of Monland-Burma I June 2013 Methamphetamine is prohibited in in Ministry of Health Notification No. 2/2002 issued 21 June, 2002 and Kratom Leaf in Notification No. 3/2002 issued 29 July, 2002. 65 US Department of State Bureau for International Narcotics and Law Enforcement Affairs (INL), ‘2012 International Narcotics Control Strategy Report: Volume 1’, 2013, pp.112-113. to the 1993 Memorandum of Understanding on Drug Control Cooperation’, 2013, p.1. 67 INL, ‘2012 International Narcotics Control Strategy Report: Volume 1’, 2013, pp.113- 114. 69 In 2009 the Burmese Government reported an anomalously high seizure of nearly 24 million ATS pills. However, this has been attributed to the government using drugs policy in this year to put pressure on drug-producing armed groups to come under their control (UNODC, Amphetamines and Ecstasy: 2011 Global ATS Assessment, 2011, p.21). 70 UNODC, Myanmar: Situation Assessment on Amphetamine-type Stimulants, 2010, p.17. 71 INL, ‘2012 International Narcotics Control Strategy Report: Volume 1’, 2013, p.114. 72 WHO, ‘Atlas of Substance Use Disorders, Country Profile: Myanmar’, 2010. 73 UNODC, Myanmar: Situation Assessment on Amphetamine-type Stimulants,2010,p.28. 75 For example, the only more specific references to Burma in UNODC’s 2012 World Drug Report are to “Northern Myanmar” (p.29) and Shan State (p.52; p.84). 77 HURFOM Interview, No. 13, Ye Township. 78 HURFOM Archives, Mudon Township, 2012. 79 UNODC, Amphetamines and Ecstasy: 2011 Global ATS Assessment, 2011, p.31. 80 HURFOM Interview, No. 8, Thanbyuzayat Township. 81 HURFOM Interview, No. 35. 82 Human Rights Foundation of Monland-Burma I June 2013 INL, ‘2012 International Narcotics Control Strategy Report: Volume 1’, 2013, pp.112-114. 83 Daw Aung San Suu Kyi, speech at NLD Central Executive Committee meeting, Rangoon, 27 May 2013. 84 HURFOM Interview, No. 36. 85 HURFOM Interview, No. 10, Ye Township. Paung Township, Mon State’, 27 May 2013. 90 HURFOM Field Report, No. 2. 91 HURFOM Field Reports, Nos. 2 & 3; HURFOM, ‘Tracking the dangerous drug trade’, 11 January 2013. 92 HURFOM Interview, No. 31, Tavoy District. 93 HURFOM Field Report, No. 3. 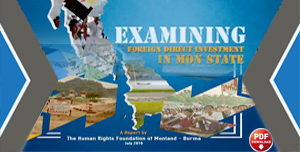 94 Human Rights Foundation of Monland-Burma I June 2013 Story detailed in HURFOM, ‘Tracking the dangerous drug trade’, 11 January 2013. 95 HURFOM Interview, No. 31, Tavoy District. 96 HURFOM Field Report, No. 3. 97 HURFOM Interview, No. 30, Ye Township. 98 HURFOM Interview, No. 32, Ye Township. 99 HURFOM Interview, No. 37, Ye Township. 101 HURFOM Interview, No. 12, Ye Township. 102 HURFOM Interview, No. 38, Ye Township. 103 HURFOM Interview, No. 14, Ye Township. 104 HURFOM Interview, No. 39. 105 UNODC, Myanmar: Situation Assessment on Amphetamine-type Stimulants, 2010,p.8. HURFOM Field Report, No. 3. 107 HURFOM Interview, No. 3, Mudon Township. 109 HURFOM Interview, No. 1, Moulmein Township. 110 HURFOM Interview, No. 24, Myawaddy Township.